Mountain House 2 Day Emergency Food Supply Giveaway! Do you have any quick cook meals in your food storage? I am a real believer in ingredient based food storage, but I keep a variety of pre-packaged meals on hand for times with we need something fast and easy. I also use them in my emergency kits. And on spur of the moment fishing trips. Mountain House is consistently one of my favorite foods for quick camping or emergency meals because they cook up so fast and easy, require almost no clean-up, and actually taste good! Yes, that means the kids AND my man will eat these. They have a lot of different varieties of meals, so what if you want something to feed your family or stash in your emergency supplies that makes your choice easy? 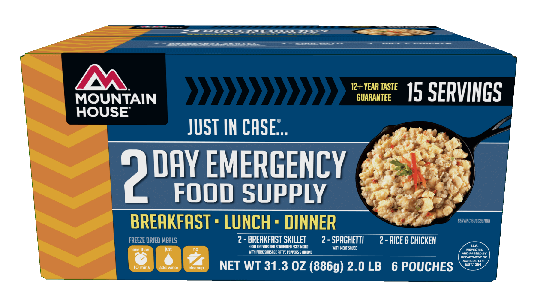 Well, the awesome folks at Mountain House have come out with a convenient way to get some emergency meals in your stash by introducing Multi-day Just in Case emergency meal kits! These pre-packaged kits include Mountain House meal favorites and are designed to feed one individual three meals a day. They are available in kits packed for different lengths of time from 2 to 14 days. I recently tested out some Mountain House meals on a fishing trip. I’m telling you, nobody is disappointed when I bring Mountain House along on an outing. 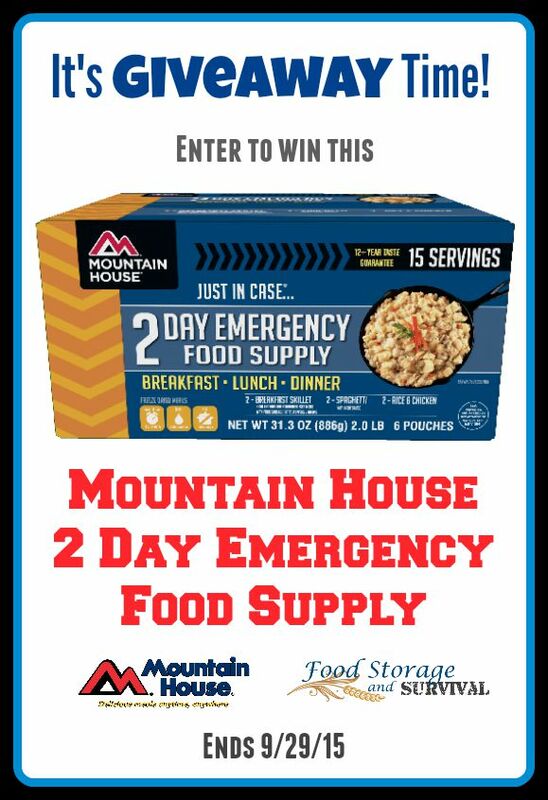 Now I know you want to stock your emergency supplies with some easy, delicious meals, and Mountain House has graciously offered to give one lucky winner one of the new Just in Case 2 Day Emergency Food Supply kits! This kit contains 2 Breakfast Skillet meals, 2 Spaghetti with Meat Sauce, and 2 Rice and Chicken. I’ve personally tried each of those meals and you won’t be disappointed. Entering is easy! Just use the form or link below. Entries for checking out the Facebook pages of Food Storage and Survival and Mountain House, following me or Mountain House on Instagram, following me on Pinterest, subscribing to my YouTube channel, AND referring friends to this giveaway! And hey, one free entry for everyone just because I don’t want anyone left out. Even those of you who don’t do social media of any kind (just FYI, you and my husband would get along swimmingly).